Frederick Abernathy is Gordon McKay Research Professor of Mechanical Engineering and Abbott and James Lawrence Research Professor of Engineering in Harvard University’s School of Engineering and Applied Sciences. Kermit Baker is a Senior Research Fellow at Harvard University’s Joint Center for Housing Studies. Kent W. Colton is President of The Colton Housing Group and is a Senior Fellow at Harvard University’s Joint Center for Housing Studies. David Weil is Professor of Economics and Everett W. Lord Distinguished Faculty Scholar at Boston University School of Management. Chapter 1 Home Building—Is Bigger Better? In these challenging times, in order to be successful, a home builder needs to excel at land assembly, marketing, on-site operations and customer satisfaction. The Harvard home builder study lays out very clearly what national builders have done well, and where they could benefit from improvements. This book provides a roadmap to improve competitiveness in today’s demanding economic environment while increasing productivity as the market recovers. This book is filled with descriptive institutional detail and analytical insight. It looks at the industry from a range of perspectives, and it is ultimately positive in its outlook. It is hard to find this kind of balance today. The implosion in home building is a wakeup call to modernize this important industry. The authors make a persuasive case that home builders have much to learn from other industries that have successfully balanced innovation and scale leading to greater efficiencies. Scale offers significant opportunities in the homebuilding business. However, as in any business, execution is the key. 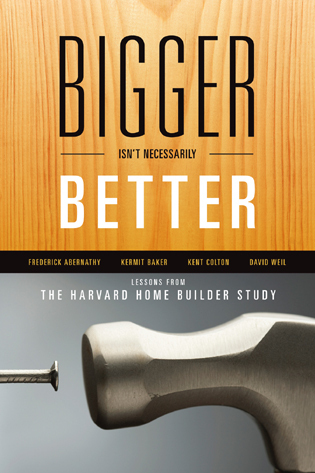 Bigger Isn't Necessarily Better provides a thorough analysis of where home builders have been able to leverage their competitive advantages, where they have not, and therefore how they can become more efficient as market conditions dictate. This is a landmark study of the industry on an important topic. You can feel the touch of four different hands in the presentation of the material through nuances of style and emphasis. This is a good thing for this work, as the four different kinds of expertise are unified into one theory: it adds texture and personality to the narrative. The authors also offer a generous spread of graphic materials to help the reader grasp the large amount of data presented in the book. ... As the book cover illustrates, the authors hit the nail on the head with their analysis. The study and its presentation flow nicely and avoid the propensity of this type of tome to sink into the gravity of its material. The authors deliver on the promise in their book’s title: through a lucid, well-ordered presentation of graphics and prose, they discern, explain, and share the lessons learned from the workings of the large home builders during of the last housing boom. Now it’s our turn—to study and apply these lessons so that we can do our share within the building industry to contribute to softer landings for all during future market downturns. 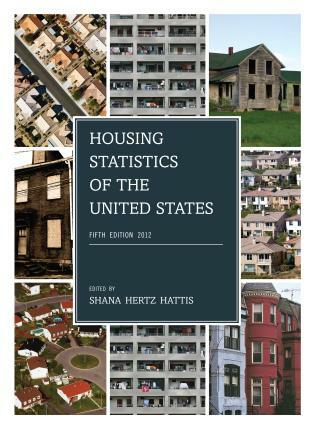 Explores industry trends in residential construction during the late 1990s and early 2000s and their relationship to the housing boom and bust, based on data from the Harvard Home Builder Survey.